Israeli Prime Minister Benjamin Netanyahu announced, on Wednesday, plans to build new settlement for Jewish settlers evacuated from the illegal outpost of Amona. 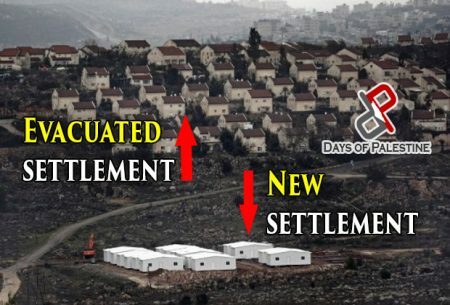 The new settlement would be the first one to be officially planned, approved and built in some 25 years. While Israel stopped establishing new settlements in the early 1990s, outposts set up since then have been retroactively given approval, and existing settlements have expanded their footprints, sometimes being neighbourhoods of existing settlements in name only. In a statement, Netanyahu’s office said he had instructed a team to look into possible locations for the new settlement. The team consists of his chief of staff, representatives of the settlement movement and defence Minister Avigdor Liberman’s adviser for settlement affairs. The statement said, according to Days of Palestine, that Netanyahu — just a month and a half ago — promised the settlers a new settlement if efforts to save Amona failed. The announcement was made as police were evacuating the West Bank outpost, which the Israeli High Court of Justice has long held was built on privately owned Palestinian land. After years of legal wrangling, the High Court in 2014 ordered the government to evacuate and demolish the hilltop settlement by December 25, 2016. But, under fierce pressure from settlers and their Knesset supporters, the government sought to reach a compromise with residents that would allow them to remain in their settlement without circumventing the court. In late December, a deal was struck that would see 24 of the outpost’s 41 families moved to an adjacent plot of land on the same hilltop, while the rest would relocate to the nearby settlement of Ofra. In the less than two weeks, since new American President Donald Trump took office, Israel has announced the construction of some 6,000 new homes in existing settlements, drawing rebuke from the international community. The Trump White House has remained silent, a dramatic departure from the vocal condemnations issued by Obama.